The Intonarumori (noise intoners) were a family of musical instruments invented around 1913 by the Italian Futurist composer and painter Luigi Russolo. Each instrument was made of a parallelepiped sound box with a speaker on its front. Inside the box, a gut or metal string was excited by a rotating wheel. The speed of the wheel was changed by the player by using a crank, while the tension of the string was varied by using a lever. Such instruments were acoustic noise generators which allowed to simulate different everyday noisy sonorities. According to Russolo, the Intonarumori created different kinds of everyday sounds, from rumbles to screeches. The Intonarumori were a consequence of Russolo's theories regarding the structure of the futuristic orchestra. With the belief that the traditional orchestra needed some new sonorites, in his book ``The Art of Noises'' he proposed a taxonomy of noise sounds having six families of noises. Noises were divided in rumbles, whistles, whispers, screeches, percussion noises and human and animal voices. 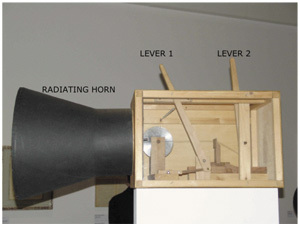 The 27 varieties of Intonarumori built by Russolo and his colleagues aimed at simulating such variety of noises. The different names of the instruments were created according to the sound produced: howling, thunder, crackling, crumpling, exploding, gurgling, buzzing, hissing and so on. During World War II, all the original Intonarumori got destroyed. Several attempts to rebuild such instruments were made. Among them, the ones shown in Figure 1 are some reproductions recently shown at the exposition Sounds and Lights at the Pompidou Center in Paris. 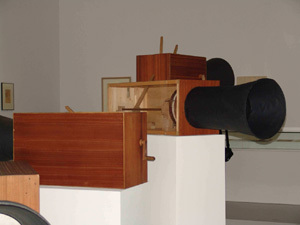 Figure 1: Reproductions of Russolo's Intonarumori as shown at the exposition "Light and Sound" in Paris, December 2004. As seen in Figure 1, the external appearance of each Intonarumori is similar. Each instrument is made of a sound box with a radiating horn attached at one extremity. The different timbres of the instruments are mainly do to the different excitation mechanisms, and are the origin of the names of the instruments. As an example, in the Gracidatore (the Croaker), whose excitation mechanism is shown in Figure 2, the shape of the rotating wheel allows to obtain plucked string sonorities. 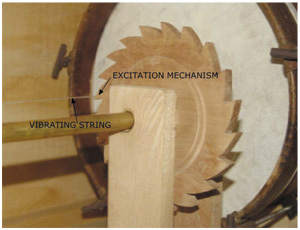 The wheel, rotating at a speed controlled by an external crank, excites a vibrating string attached at two extremities of the wooden soundbox. The player, as in the other instruments, is able to control the tension of the string by using an external lever. Figure 2: The excitation mechanism of the Gracidatore. 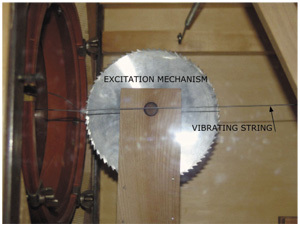 In the Crepitatore (the Cracker), shown in Figure 3, the excitation mechanism is a metal wheel, and two levers are present, as well as two vibrating strings. This allowed the string attached to the drumskin to be different from the one excited by the rotating wheel. Figure 3: A reproduction of the Crepidatore. The same idea was also adopted in the Stroppicciatore (the Rubber). Documents and patents did not succeed in explaining the role of the two strings in the resulting sonorities produced by the instruments. In the Ululatore (Howler), described by Russolo as "soft, velvety and delicate", shown in Figure 4, the excitation mechanism was a metal wheel. Figure 4: The excitation mechanism of the Ululatore. Russolo and his assistant Ugo Piatti researched all the physical aspects that could be varied in order to obtain different timbres and sonorities, in order to achieve a satisfactory simulation of the different families of noises. As an example, the string was either steel or gut, the wheel either metal or wood, with its rim notched with small teeth or smoother, and the skins were soaked in a variety of special chemical preparations. Furthermore, the pressure of the wheel against the string, stronger than is necessary with a violin bow, created a louder and noisier sound quality. Russolo also experimented with more radical Intonarumori, based on electrical rather than mechanical control, such as the one used in the Hummer (Ronzatore), which was more a percussion than a string instrument. It has been suggested that the electrical control might have been due to the need for a speed that was too rapid to have been achieved manually. As a supplementary enhancement, a second lever was added in the Burster (Scoppiatore), the Whistler (Sibilatore) and the Gurgler (Gorgogliatore). In his writings, Russolo does not explain the need for such second lever. The understanding of the sound production mechanism of the instruments from the Intonarumori family is a fundamental step for the development of computer simulations of such instruments, as well as physical reconstructions of them. Such computer simulations are important for preservation of the instruments and development of new extended musical instruments.